The Favorites is a series briefly exploring films I love, to find out what makes them - and me - tick. Satantango (1994/Hungary/dir. Bela Tarr) appeared at #68 on my original list. What it is • To describe Satantango as the tale of villagers grieving the loss (by neglect) of one of their members, deceived into leaving their decrepit homestead by a devious, messianic con man would, in a sense, be accurate. But it would also be highly misleading, like describing the history of humanity in terms of biological evolution. Sure, the process traces an overall shape but the essence of the experience is captured in fleeting yet all-enveloping individual perceptions. Over the course of seven hours the aforementioned events occur, but the real gravity of the film lies in its moments, all of which Tarr stretches out to a point that bypasses tedium and achieves transcendence. Attempting to verbalize the film's sequences doesn't do them justice. A group of villagers dance endlessly to almost comically repetitive music. A little girl, ignored by everyone around her, focuses her own diabolical attention on a pet cat. A cruel conniver, initially far from home, returns to this hamlet that feels like some sort of distant planet, at once a microcosm and an idiosyncrasy. Even detailing how Tarr shoots the scenes, through relentless long takes employing glacial movement and frequently ridiculous behavior, makes the film sound like some sort of perverse intellectual exerecise when in fact it's anything but. By some sort of alchemy, Satantango's grimy, deeply textured surfaces immerse us in a sensation that escapes words, that escapes even camera movements or compositions. I can't quite put my finger on Satantango's elusive yet palpable power, a dilemma exacerbated by the fact that before writing about the film for this series, I could only watch random video extracts, out of order and out of context. I've seen the film only once, about six years ago, and it left a strong impression on me. When I began this "Favorites" series, I didn't rewatch the first few entries, relying on my own memory (these reviews began only a year after I composed the list, so many of my choices were fresh in my mind; now it's going on six years since writing, on a last-minute whim, "100 of My Favorite Movies"). Starting with Death by Hanging at #94, I've endeavored to view every film before writing and have only reached a few stumbling blocks: Miraculous Virgin was the last film I couldn't track down, and now Satantango follows in its footsteps. In this case, however, a lot of the material was available online - a surprising amount in fact (I probably ended up seeing about a sixth or even a fifth of the movie, once you add it all up; for example, the entire "Estike" passage was on YouTube). Watching these extracts, I was reminded of why I found the film so hypnotic a half-decade ago and also why the essence of that appeal remains elusive. I should also note that the film doesn't simply flow seamlessly for me; there are moments that feel very jarringly stylized or even a bit - dare I say it - postmodernly prankish. Some of these shots make me laugh (like the two lovers sucking on a shared breadstick), but all of them take me a bit out of the experience and lead me to wonder if Tarr is, albeit brilliantly, putting us on. In general, however, those sections are few and far between - what's most notable about the film is how it doesn't quite belong to its moment, the year of Pulp Fiction or Three Colours: Red, films which may be arch or earnest, but are certainly self-consciously aware of their position in history. I'm not even sure when Satantango takes place; references to collectivism and the authorship of the original novel in 1985 suggest that it's before the fall of Communism but the scenario is suffused with the disorientation of a system that has already collapsed. In addition to the sense of totemic visual and aural immersion, there are sensations I bring to the film and impose upon the images - the intoxicating confusion of a movie somehow lost in time. The characters feel like they are already living in a future (recall the film's decade was loudly touted as the end of history) and yet, from today's standpoint, nearly a quarter-century later, they are quite a bit in the past (Tarr himself, a youthful thirty-eight when completing this picture in the postmodern mid-nineties, is now already in his sixties). Somehow watching this movie evokes a completely mixed-up sense of past, present, and future colliding/intersecting/dissolving into one another. Those evocative landscapes - sparse little woodlands you can see straight through, open plains disappearing into the foggy distance, decaying buildings that feel deeply rooted yet completely captive to the present - are about as lucid a depiction of place as cinema has ever achieved. But Satantango is both highly specific and impossible to pin down. I guess that's why I love it. How you can see it • Well, unfortunately that's a tough one. Appropriately for a movie that surges forward and sinks back by turn, Satantango's availability has flickered and faded. At least for Region 1 DVD-watchers, the movie is almost impossible to get ahold of now. In 2006, it was released on Facets with much fanfare - the reviews suggest the miraculous, maybe slightly melancholy, emergence of a film that had been destined for occult-like obscurity. Now, almost as miraculously, it has disappeared again. Even used copies prove elusive (online hunts mostly turn up editions of the novel - causing you to wonder if you've simply imagined the existence of this visionary adaptation, one acclaimed enough to crack the top fifty of the vaunted Sight & Sound list). That said, if you can play other regions, the film is out there and worth investing in. And if you want to journey through the perplexing peripheries of Satantango, just search for the title and check out the video results. In its own unintentional way, this form of viewing feels just as suited to the strange textures and tonalities of the experience as immersing yourself in it for the long haul. What do you think? • Does the film evoke a particular moment in both cinematic and world history, or does it feel timeless to you? Are the characters and their encounters alienating? What do you make of the near-utopian passages near the end (utopian, but ultimately, cynical)? How do you feel about Estike, particularly during and after the scene with the cat? 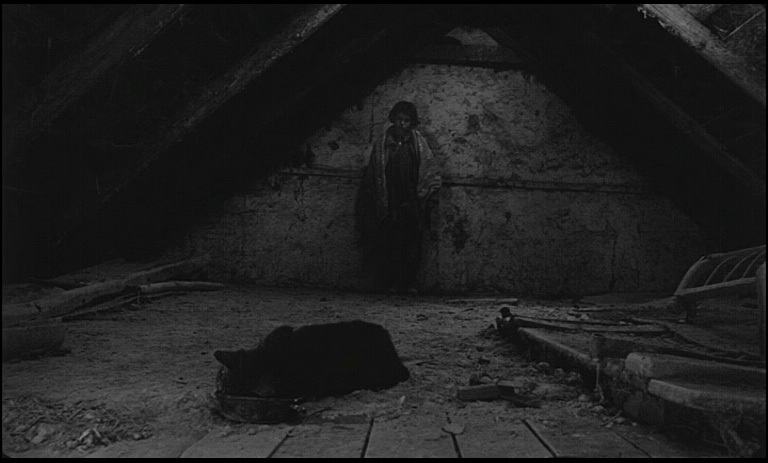 Do you think this is Tarr's masterpiece, or are later - or earlier - works more impressive? What traditions and other filmmakers does he recall and in what ways does he develop and/or abandon them? Have you seen Satantango on a big screen and if so, how did that experience differ from home video viewing? When you watched the film, did you split it into sections or watch it all straight through? If you've revisited parts of it later, which parts and why did you choose not to watch it all as a whole again? Do you find the film funny at all? Do you think it is removed or immersive in its take on the characters and this world?